Last year I reviewed three wines by the Bogady family, and now they're back with two more! Today I'm reviewing Bogadi Bodega & Vineyard 2015 Viognier and in a few days I'll publish a review of their James Charles 2015 Petit Verdot. In February of 2016 I reviewed Bogadi Bodega & Vineyard 2014 Seyval Blanc, James Charles 2014 Viognier and Veramar Vineyards 2014 Cabernet Franc. Viognier originated in France's Rhone Valley. Even though it's seeing great success in California, it's become the pride and joy of Virginia viticulture and winemaking. Virginia has the longest history of winemaking in the United States of America (Texas and California made wine much earlier but weren't a part of the USA until much later). Wine from the native species' of grapevines had been made there since the early days of English colonization. Many attempted to grow vitis vinifera (the European species for making wine) but the vines just kept dying. Thomas Jefferson (drinker, collector and "America's first wine expert") planted vinifera at Monticello in Charlottesville. He failed. Since it was discovered that the culprit was the phylloxera aphid, Virginia has blossomed into a gorgeous vinifera wine country. The color of Bodadi's 2015 Viognier is a pale straw yellow. On the nose it's like you just stuffed your face into a bouquet of honeysuckle and white flowers. There's chunks of pineapple and kiwi in that bouquet too, which would make for an awkward presentation to your love interest but at least it smells nice. In the mouth it's full bodied with a slippery smooth mouthfeel and a medium acidity. On the palate there's tangerine, pineapple and kiwi. The finish is exceptionally long with flavors of pineapple and... you know when you get a handcraft vanilla ice cream that cranks the vanilla up to 11? I mean, it's not just vanilla; it's Supervanilla? When you realize it's a spice and not just a flavor? Yeah, that vanilla. 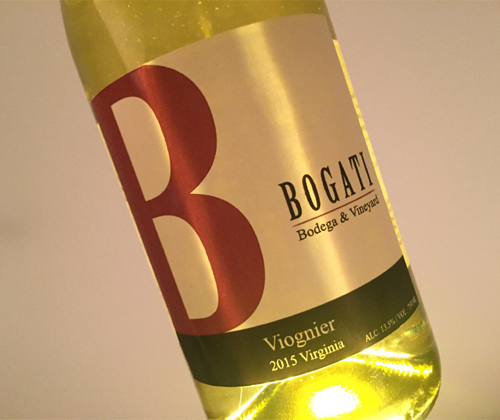 Bogati leaves no doubt why Virginia has taken to Viognier with this powerhouse of flavor. I love this stuff!